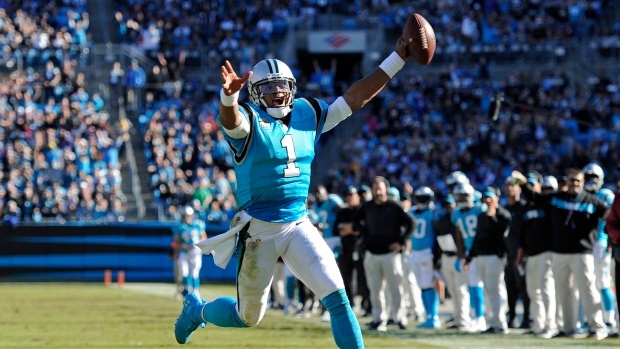 CHARLOTTE, N.C. — Cam Newton and the Carolina Panthers didn't wait until the fourth quarter to turn it up a notch on offence. The result was an impressive win against the league's top-ranked defence. "We present a lot of issues for defences and that is what this offence was kind of built for," Newton said. "We have dynamic players all around the field." The Panthers rolled up 386 yards against a Ravens defence that had come in allowing a league-low 280.6 yards and 14.4 points per game. When asked why Carolina's misdirection offence was so effective, Ravens cornerback Jimmy Smith held up one hand and said, "Look at my hand. Now if I smack you with this one (my other hand), you won't see it coming. That's how it works." Panthers kicker Graham Gano extended his streak to 39 consecutive field goals made at home — and 28 straight overall — after connecting from 54, 44 and 30 yards. How many coaches have the guts to make this call? Leading 7-0 in the first quarter at Carolina, Ravens coach John Harbaugh went for a fake punt from his own 10-yard line on a fourth-and-1 — and Baltimore appeared to pick it up easily with Anthony Levine plowing ahead for an 8-yard gain. However, the Ravens were called for an illegal shift on the play, wiping out the first down, and they wound up punting. Facing a fourth-and-7 at the Baltimore 44, coach Ron Rivera sent in backup QB Taylor Heinicke to throw an apparent Hail Mary with Newton's shoulder still sore from last week's game. But after the Ravens defence backed off, Heinicke saw Olsen alone lined up to the left side and he hauled in a 13-yard pass and ducked out of bounds with 2 seconds left. Gano came on to boot a 54-yard field goal to give Carolina momentum heading into the second half.